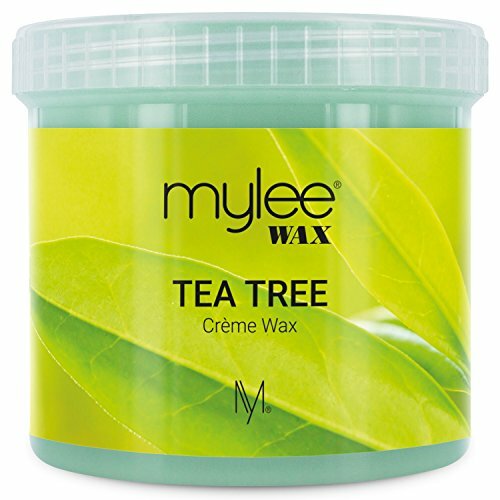 Mylee Tea Tree Creme Wax - High performance creme wax for silky smooth professional results. - For many years Tea Tree essential oil has been extracted for its outstanding health benefits with antibacterial, antimicrobial and antiseptic healing properties. - Mylee Tea Tree Creme Wax contains the perfect combination of Tea Tree and Mineral Oil to protect delicate and sensitive skin during waxing. - An excellent wax for removing unwanted hair from all areas of the body. - Perfect for both home and salon use. - We recommend all waxes are patch tested before use. - Please note crème wax is sticky. - Follow directions carefully for quick and easy hair removal. - Switch on the unit setting to high to melt the wax, when melted adjust to medium. - Stir thoroughly until the wax has a similar consistency to syrup, ensuring wax is completely melted. - Using a spatula, scoop a nut-sized amount of wax, apply a thin coat of wax on the hairs to be treated, then rub down a paper strip over the area. - Leave for a few seconds, hold the skin taut and pull the paper off in a quick motion.